UVic's first ever Campus Cycling Plan is ready to roll! UVic's new Student Housing buildings are referenced in the CleanBC report as examples of cleaner public-sector buildings. Click here to read the full report (or skip to page 31 for UVic's feature)! UVic has begun planning for a minimum of 600 new beds on campus to provide much-needed housing for students. Click here to find out more! Sustainability is a core value and it is reflected in the design, construction, and operations of every new building on campus. The David Turpin Building is one of the facilities on campus that achieved Gold level status in the Leadership in Energy and Environment Design (LEED) Green Building Rating System. UVic has begun planning the Campus Greenway Landscape Design concept. The next open house is Thursday March 21, click here to find out more! Physical changes at UVic are guided by the long-term vision and framework for development set out in the Campus Plan. 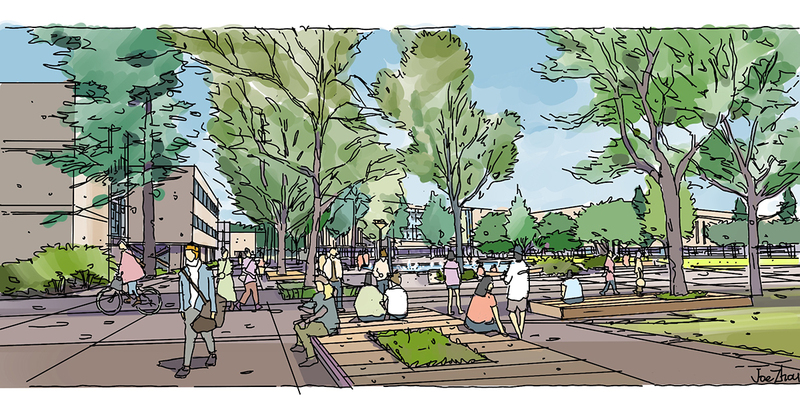 Plan goals provide for a land use and building pattern that respects the unique physical environment and encourages social interaction, allows for safe pedestrian-friendly links throughout the campus, promotes compact sustainable development and operations, and the use of public transit, cycling and walking. The university is committed in its planning processes to developing and maintaining active communication and collaboration with all those affected by its physical changes. Throughout 2015, UVic undertook an exciting year-long process to shape the future of the campus. The Campus Plan establishes a refreshed vision and set of directions that will guide decision-making on matters ranging from buildings and transportation to open space and natural areas over the next ten years. The new Campus Plan reflects information-gathering, background research, analysis, planning, and extensive engagement of diverse campus and broader community stakeholders, and it was approved by the Board of Governors on January 26th 2016. For more information, visit our Campus Plan page. The office of Campus Planning & Sustainability acts as coordinator and resource for students, staff and faculty working towards the shared goals of advancing sustainability at the University of Victoria. Information on sustainability resources, news and activities is available here.